When Scott Burton left WDGY, he went to Washington DC to do afternoon drive on WWDC, a MOR station at the time. Although you will still hear "The Sound of Scott" and "The Burton Extravaganza"), this is a slightly different Scott Burton, as he is able to do a little more talking than he was able to do at WDGY. 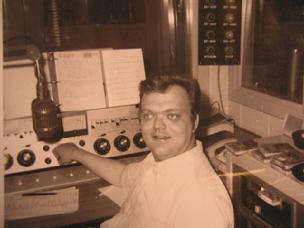 Al read about the passing of Bob Moomey (Johnny Dollar on WDGY) and also enclosed an aircheck of Robert W. Morgan on WIND in Chicago recorded in the Fall of 1971. Al visited Bob Moomey during Spring Break 1972 and when Bob was the program director at WIND. Bob told Al how proud he was to have hired Robert W. Morgan for awhile as WIND's morning man. Al mentions that Bob had placed color photos in the WIND studio. Listen to the aircheck to get Morganized. Contributed by Al Arneson, Edina MN, Formerly "Big" Al Davis on U-100. This is a rare recording of Jim Dandy's brief return on air visit to WDGY sometime in 1976 (Based on the music - August/September). He mentions this is a Tuesday and the time is 9:21 AM. Jim is still irreverent with his insults. He calls the Richfield High School girls, "Skaggs." He later throws insults at Petula Clark, calling her a "Skagg" and stating that there are more fingerprints on her than on the front door of Duff's. At the beginning of the tape you can hear there is a small audience in the background, later referred to as the WDGY staff. Dandy mentions this is his last 36 minutes on the air. He announces Gary Bridges is up at 10 AM. Both Jim and Johnny are looking for a hangover remedy and Jerry Brooke's bartender. Jerry will be on tomorrow morning. I am not sure how far ahead of the format change to Country this recording is, but I think it was close. This rare tape was sent to me by Al Arneson, of Edina (Big Al Davis on U100 - aircheck at www.radiotapes.com/U100Radio.html).